Location: I was born and raised in Houston, TX, but moved to the Bay Area many years ago to attend Stanford. Although I’m technically a transplant, at this point, San Francisco definitely feels like home. Currently, I’m an investor at Canaan. We’re an early-stage (Seed – Series C) fund with $5B in AUM and we invest in both tech and life sciences. I’m based in our Bay Area offices and split my time between Menlo Park and San Francisco. Years of VC experience: My 2-year work anniversary is quickly approaching. Prior to joining venture, I was an operator. Position description: My role is twofold: I co-lead Canaan Beta which is our consumer seed practice. With Beta, I’m an independent check writer leading investments in early-stage, consumer-facing businesses. I also work closely with our SaaS portfolio. In that role, I’m primarily leading diligence and taking board observer seats for Series A / B enterprise software companies. My story is somewhat unique in that I was recruited into venture. At the time, I was working at a high-profile, fast growing startup and was under the impression that venture is a career option only after business school or a startup exit. Thankfully, I was wrong and took that leap of faith. There’s no “right way” to get into venture, although most people in the industry tend to have one of three profiles: the ex-operator, the ex-banker, or the ex-engineer. Speaking to the operator to VC transition, if you’re fortunate enough to join an interesting company in its very early stages and do exceptional work, there’s a decent chance you’ll have visibility into the board and sometimes even into the company’s fundraising. That’s a good way to start building relationships and a way to better understand what makes different VCs tick. Blogging and tweeting can also be incredibly effective. Platforms like Twitter have really democratized access to GPs and founders and can give you a platform to share your point of view on relevant topics. And finally, organizations like Parity Partners & All Raise exist to help increase the number of women and underrepresented minorities in our industry. The first is commonly shared, but true: your career is a marathon not a sprint; trust (and enjoy) the process. What’s particularly challenging for a junior person in venture is that everyone is aggressively trying to climb the partner ladder and the feedback loops are very long, so it takes several years to find out if you’re any good at this job. The natural inclination for any type A person is to work extremely hard to get to that check writing ability at the end of the tunnel, but it’s important to be reflective and enjoy each stage of your career, no matter where on the totem pole you are. There really are lessons to be learned at each step along the way. I still remind myself of this. Second, understand your own point of differentiation and defensibility. When diligencing companies we always ask “How is this company defensible?” but I rarely see people asking themselves how they themselves are defensible in the current workplace where there’s an overabundance of information that’s easily accessible and an increasing amount of competition. Be introspective. Know how you’re uniquely positioned to provide value in a way that others cannot and leverage that. I’m a first-generation American. My mother is from Eritrea and my father is from Ethiopia. Today, Ethiopia is the fastest growing economy in Africa and the third-fastest growing economy of a country with 10M+ people, in the world. Despite the way these countries are typically portrayed and despite the challenges they’ve faced with political instability and poverty, I think there’s a tremendous amount of promise and opportunity there. Many, many years from now, I would love to be able to take elements of the tech and venture ecosystem we’ve built here and replicate it there, with a particular focus on social entrepreneurship and impact investing. Thankfully, there’s an abundance of publicly available information online to help get people up to speed on the work that we do. FoundersClub has a great primer on VC called “Understanding Venture Capital.” Books such as Venture Deals by Brad Feld, The Hard Thing About Hard Things by Ben Horowitz, and Zero to One by Peter Thiel, should be requisite reading for those looking to join the industry. Industry-specific news publications such as TechCrunch, Axios, and Wired are also top of list. There are also dozens of newsletters such as Connie Loizos’ StrictlyVC and Dan Primack’s Pro Rata that deliver relevant daily news directly to your inbox. Depending on your sector and stage interests, it can also be worth subscribing to a particular VC firm’s newsletter, blog, or podcast to learn more about their investments and investment methodologies. I’m going to assume that qualities such as integrity and tenaciousness are table stakes here. 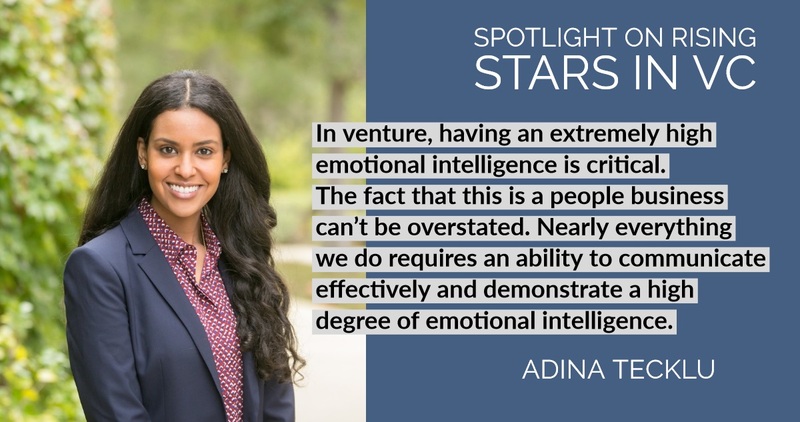 In venture, having an extremely high emotional intelligence is critical. The fact that this is a people business can’t be overstated. Nearly everything we do – from reading a room to understand subtle founder dynamics to recruiting on behalf of our portfolio companies to pitching the value of our firms and ourselves to managing interpersonal issues on a board to serving as a trusted partner to our entrepreneurs – requires an ability to communicate effectively and demonstrate a high degree of emotional intelligence. I also appreciate VCs with an affinity towards collaboration. Venture can be lonely. The best way I’ve heard the dynamics of a venture firm described are that it’s an individual sport, but you’re all wearing the same jersey; I don’t think it has to be this way. The people I’ve enjoyed working with most see the value of leveraging the perspectives and skill sets of folks around to table to drive the most value for the collective portfolio. And finally, I really admire visionary VCs. Those who study macro trends, understand market timing, and invest in the future they want to live in 5 or 10 years from now. Beyond honing my craft, being a reliable teammate, astute investor, and value-add board member, I hope that I’m able to play my part in changing the narrative of what a successful venture capitalist looks like. In doing so, I hope that I’m also able to provide funding to exceptional underrepresented entrepreneurs who might not otherwise have access to capital because of their network or because the business they are building doesn’t inherently resonate with the VC sitting across the table from them. There’s a lot of good in our industry, but we definitely have room for improvement. Creating a more diverse, inclusive industry, is one such area. Keep up with Adina via her LinkedIn and Twitter!